Remove the cover from the back of the clock to reveal the movement compartment. Install three fresh “AA” size alkaline batteries in the battery holders according to the (+) and (-) symbols in the holders. Turn the TIME SET button to set the clock hands to the correct time. Slide the CHIME ON/OFF switch to the music note position. Press the CHIME SET button and count the number of times that the clock strikes after playing the Westminster melody. Each time the CHIME SET button is pressed the number of strikes increases by one. Continue pressing the CHIME SET button until the number of strikes matches the current hour. For example, if the current time is 8:22, press the CHIME SET button until the clock strikes 8 times. 2. After setting the chime, if you find that the clock does not chime during the day, but does chime at night, press the chime set button 12 times to adjust the chime settings from a. to p.m. Turn the VOLUME CONTROL knob to adjust the volume of the chime. Slide the CHIME ON/OFF SWITCH to the crossed out music note position to turn off the hourly chime and strike. weak or exhausted batteries. Replace the batteries following the instructions above for STARTING. Never leave exhausted batteries in the clock as they can leak and damage the clock. 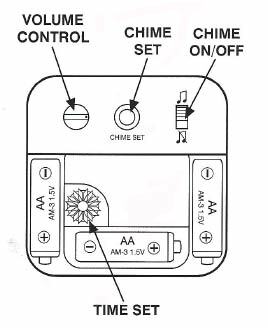 NOTE: Any time the batteries are removed from the clock, the chime must be reset as described in the HOURLY STRIKE SETTING section.